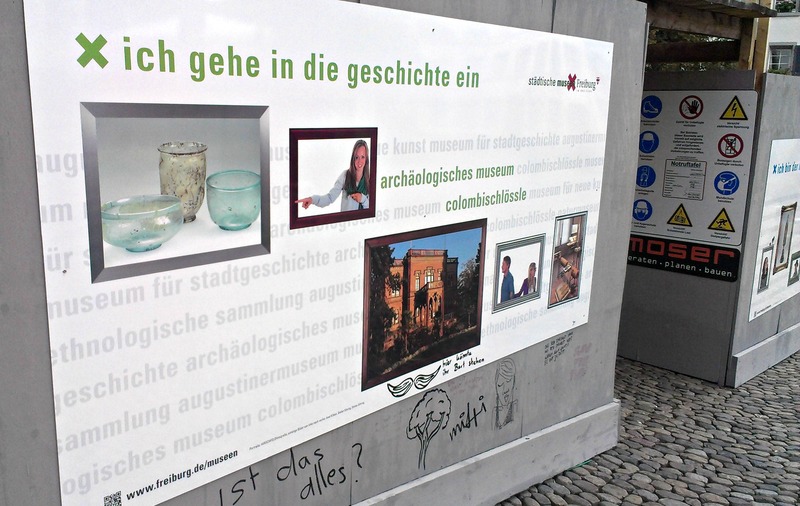 The main art museum in my city – the Augustinermuseum – is under construction. The museum is expanding, and will eventually have new galleries for graphic and historical objects. The majority of the comments have been self-explanatory, but the latest has caught my attention. Ist das alles? Is that all? Is what all? The objects the museums are highlighting? The visitor experiences the panels are promising? The goals of the expansion? Of course, it’s possible that the comment has nothing to do with the museum. But because so many others have, I’m inclined to think this is someone with an opinion. And because (as far as I can find) there are no other clear avenues or venues for sharing those opinions, people have taken to the streets. Or, at least, the walls. The walls are cleaned and the panels are changed every few weeks, so I’m waiting to see what comes next. And, it seems, I’m not the only one. P.S. It’s small to see, but someone also supplied a mustache with the text, “Hier koennte ihr Bart stehen” (Here’s where your mustache could be). Because every museum needs more mustaches.